The CleanFinancial.com guide to spread betting on Apple shares. Where to Trade Apple Shares for Free? Where to Practice Trading Apple Shares? How to Spread Bet on Apple? Note: You may also be able to take a position on Apple on other websites. 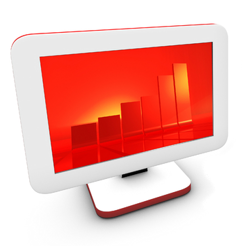 Where Can I Find Live Prices and Charts for Apple? The following CFDs chart and prices provides a helpful overview of the Apple share price. The above chart is from Plus 500 and usually tracks the Apple futures price (not the spot price). Should you want to access spread betting charts and the current prices for Apple, you will probably need a spread betting account. In addition, a spreads account would let you trade on the shorter-term daily prices. Readers should note that opening an account is subject to suitability and status checks. Should your application be approved then, after logging on, you will be able to review the real time charts and prices. Usually, these are provided for free. What's the catch? You're likely to get the occasional letter or email from the spread betting broker. If you do decide to trade then be aware that spread betting and contracts for difference involve a high degree of risk to your capital and can result in losses that exceed your initial deposit. For more details, see Advanced Apple Trading Charts below. The shares are lower than the 20-day MA of $155.84 and lower than the 50-day MA of $157.61. Price data from Google Finance. 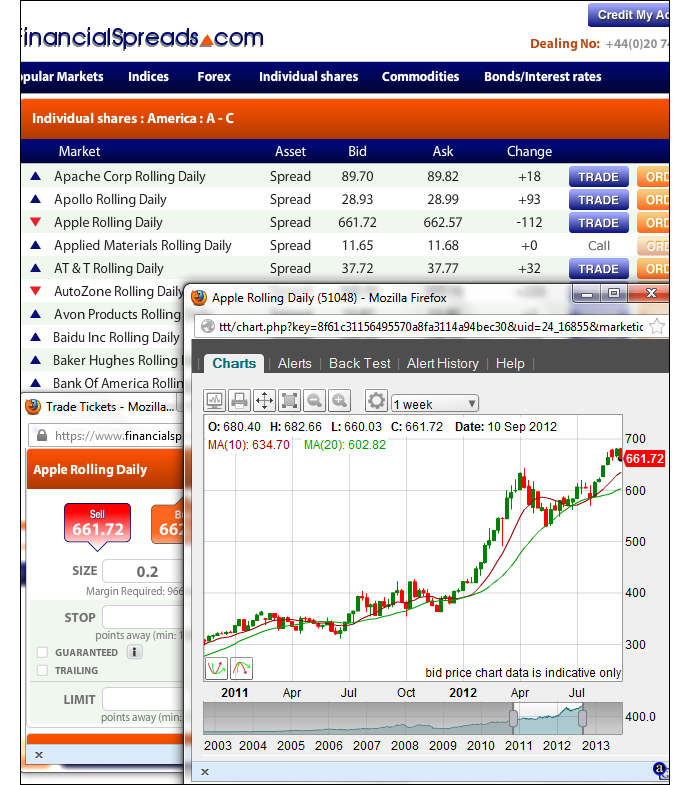 Also see Live AAPL Share Price & Charts and About Apple for more information. 07-Aug-15 [12:39pm] Apple Stock Exiting a Triple-Top: Shares to Hit $110? Apple has essentially moved sideways this year. We could see a drop to $110 (and still stay in this year's range). 20-Jul-15 [11:29am] Record Apple Profit But a Rotten Watch? The New Apple Watch - Will The Stock Clock Up More Gains? The new Apple Watch came out yesterday and the markets were not excited by it. Interestingly IG have already brought out a spread betting and CFD app for the Apple Watch. However that app highlights the issues with size (e.g. you can trade but you can't see charts or add/update trading orders). I'm not surprised that the markets were a little nonplussed. My layman's view is that there is a real risk to the Apple stock. Shareholders have been waiting a long time for a new must-have product. I expect early orders from the Apple-faithful to be healthy but I don't see the Apple Watch fitting into the must-have category. The hope must be that a whole new range of apps for the watch make it something special. Otherwise it will do little more than detect your increasing heartbeat as the battery runs out. How to Trade the Apple Stock? I have no idea. It's not a special product but Apple's sales performance and profit margins have been special for a long time. Perhaps they know something we don't (not difficult to imagine). Perhaps their brand is strong enough to withstand an average product. Perhaps their brand takes a hit because the watch turns into a white elephant... or goes the way of Google Glass. There are too many unknowns and for now I'm going to sit on my hands. Will the Apple Watch be a 'Game Changing' Product? With the launch of the Apple Watch, IG talk to Daniel Gleeson from IHS to about potential sales volumes and whether this will be a 'game changing' product. Mr Gleeson suggests that Apple sorely needs this new product line as the smartphone market starts to reach saturation in the world's richer economies. The tech firm is facing high expectations from its upcoming launch, IG takes a look at what may be on the way and what issues they are facing. According to Re/code, which has 'cited' unidentified Taipei-based suppliers, Apple will introduce the iPhone 6 in 3Q. The tech firm will also introduce a trial model with a 5.6-inch screen with 'sapphire glass'. Having said that, we have heard other reports that the iPhone 6 will get a 4.7 inch display. The iPhone 4s has a 3.5 inch display and iPhone 5 has a 4 inch display. With Samsungs often having a larger 4.7 inch display, it looks like Apple is trying to compete on size. Whatever they are doing, it will feel like salad days again for the Apple peripherals companies. Apple have just reported record quarterly earnings but yesterday the Apple stock closed down -7.99% at $506.50. There's already been quite a bit of debate on the latest Apple earnings report for Q1 and, despite the near 8% fall, the shares are still well above the 19 April 2013 low of $385.10. Here, we gather up the data to give investors a clearer view, particularly when it comes to Apple's declining market share. According to International Data Corp, by the number of smartphones sold, Samsung shifted 31.3% of all phones in 2013, up from 30.3% in 2012. Apple lost market share, selling only 15.3% of all smartphones in 2013, compared with 18.7% in 2012. Apple sold 6m MP3 players in Q1 2013, a 52% fall on Q1 2012. iPod revenues were $0.97bn for Q1 2013. According to Apple, "We expect our traditional MP3 players to decline over time as we cannibalize ourselves with the iPod Touch and the iPhone". TheVerge.com has taken a closer look at the decline of the iPod. This article also gives an interesting chart on iPhone v iPad v iPhone sales since 2010. IG's new trading hours for Apple are now 9am to 1am (Mon to Thur) and 9am to 10pm (Fri), London time. A large range of intervals e.g. 5 minutes, 1 hour, 2 hours etc. Key technical overlays e.g. Ichimoku Clouds, Parabolic SAR, Price Channels etc. Over 30 secondary charts e.g. Relative Strength Index (RSI), Chaikin's Volatility, Projection Oscillator etc. Advert: Apple Spread Betting, sponsored by FinancialSpreads.com. You can spread bet on Apple with Financial Spreads. Where Can I Spread Bet on Apple for Free? Investing does involve risks, but if you want to open an entirely free Test Account, that lets you try out financial spread betting, see below for further details. Furthermore, don't forget that financial spread betting in the UK is currently tax free*, i.e. it is exempt from stamp duty, capital gains tax and income tax. All of the above spread trading companies currently offer a Practice Account that investors can use to study charts, practice with a range of trading orders and try out ideas. If an investor is looking to speculate on US companies such as Apple then one solution could be spread trading on the Apple share price. Whilst spread betting on S&P 500 shares you trade in £x per cent. As a result, if you decided to invest £4 per cent and the Apple share price changes by $0.23 then there would be a difference to your profits (or losses) of £92. £4 per cent x $0.23 = £92. You can also spread bet on this market in Euros or Dollars, e.g. €x per cent. One important thing to note is that this is a 'Rolling Daily Market' and therefore there is no settlement date for this market. If you leave your position open at the end of the day, it just rolls over into the next session. To find out more about Rolling Daily Markets read our feature Rolling Daily Spread Betting. Then you may buy a spread bet at $453.20 for a stake of £0.2 per cent. With such a spread bet you make a profit of £0.2 for every cent that the Apple shares increase and move above $453.20. Nevertheless, you will make a loss of £0.2 for every cent that the Apple market goes below $453.20. Looking at this from another angle, if you ‘Buy’ a spread bet then your profits (or losses) are calculated by taking the difference between the settlement price of the market and the price you bought the market at. You then multiply that price difference by the stake. Speculating on shares, whether by spread trading or otherwise, can go against you. With this example, you wanted the share price to rise. Nevertheless, it could decrease. If the Apple shares decreased, contrary to your expectations, then you might choose to close your spread bet in order to limit your losses. Note: Apple Rolling Daily spread betting market taken as of 06-Feb-13. Apple spread betting and share trading guide with daily updates on the tech firm and a real-time AAPL stock chart & live prices. Where spread bet on Apple commission-free and... » read from top.